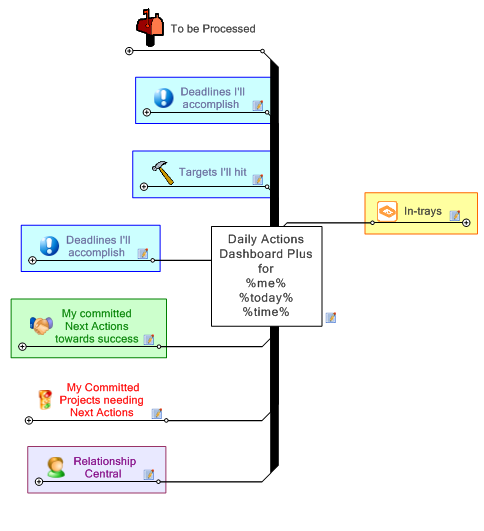 The default ResultsManager “Daily Actions” dashboard includes a branch that enumerates activities with hard deadlines in the next 7 days, but doesn’t include a corresponding branch for activities that have soft target date — you only see the overdue soft target activities in the review dashboard. If you take the approach of using target dates to keep a handle on your projects (e.g. as recommended in “Are your projects projects?“), it can be more effective if you monitor them in your daily actions dashboard. It looks like ResultsManager assigns a Due Date of “Today” for activities that have an explicit start date for some reason. In order to avoid the false-positives associated with this, the filter limits today listings to those activities that have an explicit due date. This dashboard also includes a leading branch (described in a previous post: “Its 10 O’clock, Do you know where your in-trays are“) that enumerates activities present in your in-trays that need to be processed. Note that Mike has been describing ways to improve upon the Daily Actions Dashboard by setting up filters for explicitly committed items that you might find of interest.